Does our Sun always look the same? 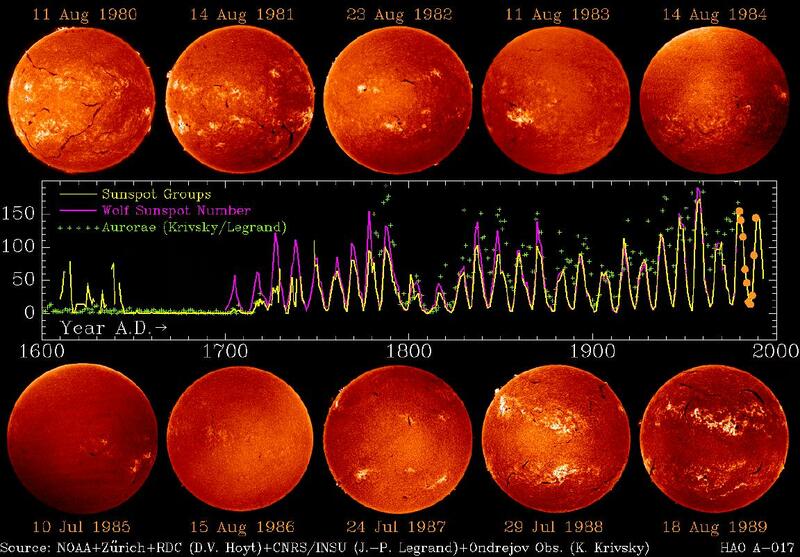 Our Sun goes through an 11 year cycle of "active" periods and "quiet" periods. This picture shows how the Sun changed between 1991 and 1995. The image at the far left shows a very active X-ray Sun (1991). The image on the far right was taken in 1995 and shows our Sun with few X-rays coming from it. The images shown in this picture are 4 months apart. ACTIVE PERIOD - Lots of solar activity including sunspots, flares, prominences, and coronal mass ejections. Our Sun was most recently active during the late 1980's and early 1990's. QUIET PERIOD - Few, if any sunspots are seen, the corona is difficult to observe, and our Sun looks black when viewed with an X-ray telescope because few X-rays are being produced. Right now, our Sun is in a relatively quiet period.